The lifestream aggregator part of FriendFeed is still important. Frienderati looks at FriendFeed as a simple aggregation of the streams of Important People, not as a place of interaction. On the power issue, I have learned that handset receive and transmit power is actually set by the network over the air. The base station can tell the handset to tune down or up real time. The rumor is because AT&T coverage is not very good (not enough base stations? ), so they set this setting very high and drain most of their 3G devices pretty quick. The power setting at AT&T is believe to be higher then European operators. Want to know why the future of FriendFeed is a search engine? Try this search. http://friendfeed.com/search?q… I get more great blog post ideas and find more valuable information from this search than anyplace else on the web today. I agree. 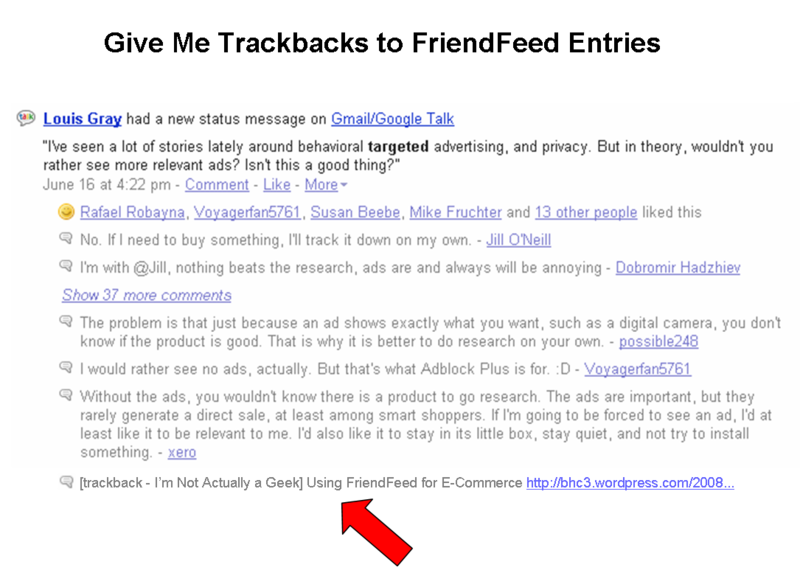 I use FriendFeed entries as points of illumination for my blog posts. The site has really generated some terrific points of view and information. For a blogger, it’s a terrific hunting ground. One thing I want: trackbacks. When a blog uses a link to a FriendFeed entry, I’d love a trackback to the blog included in the comments. When a trackback link is added to an entry, it has the same impact as a comment. It bounces the entry to the top of people’s FriendFeed page. Blog post amplifies the entry. Give it the full comment treatment. Acknowledges FriendFeed’s growing role in information creation, distribution and consumption. As a creator of FriendFeed content, I’d love to know how it’s used out there, just like a blogger.